I shouldn’t like this graphic novel. The very idea of it just seems wrong somehow, and even the art is barely a step above stick figures, but I DO like this book. I reviewed Vol.1 not too long back (read that review here). What I wrote about the style of the art and why it works, still holds true here. Jimmy kills himself. Then wakes up. Then kills himself again. Then wakes up again. Jimmy (and the reader) finally discover that when Jimmy kills himself, his ‘soul’ or ‘essence’ or whatever you want to call it, transfers into the nearest human. Everyone else sees the original person that Jimmy is inhabiting, while Jimmy only sees himself. At the end of Vol 1, someone from a government agency is on to Jimmy and appears to have an understanding of what is happening. In Vol 2, the story picks up with the government agent concocting a plan to catch Jimmy. The plan goes awry several times, but finally Jimmy is captured and the government wants to use Jimmy’s powers. It is most likely that he is a product of a government experiment gone wrong. While Jimmy isn’t keen on helping the government, they have one ace in the hole … Jimmy’s daughter (who is also the product of a Demon possession). This story moves along very quickly and I did feel that the attempts to capture Jimmy seemed to be a little repetitive (perhaps we could have done without one particular comic issue). But ultimately I really liked the new information that we get about Jimmy and the story just gets more and more intriguing. This is definitely a book that I want to keep following and if you enjoy graphic novels, don’t judge it based on a quick thumbing through at the bookstore…buy it and read it. I think you’ll find it worth while. Looking for a good book? 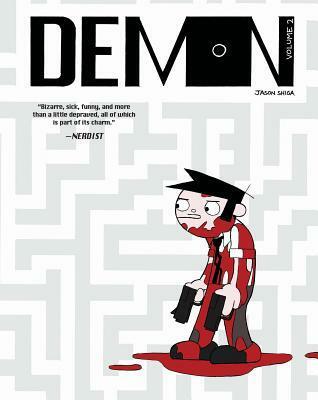 Demon, Volume 2 by Jason Shiga is a strange, dark, but very original graphic novel that should be enjoyed by fans of the graphic novel and horror genres. I have no doubt in my mind that Neil Gaiman’s Norse Mythology will become the go-to resource for anyone interested in Norse myths because 1) it’s Neil Gaiman and he seems to have a Midas touch with his books, 2) the next closest thing is Snorri Sturluson’s Prose Edda from the 12th Century so it’s about time, and 3) it’s just a really good book. 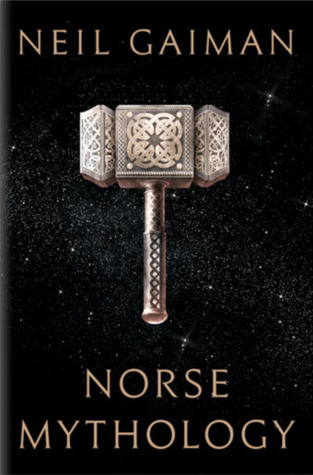 The Norse myths have finally gained some recognition lately, due in some part to Marvel’s Thor and Avengers movies, as well as the moderately recent Lord of the Rings films (Tolkien readily adapted Nordic mythology into his stories of hobbits and elves and dwarves) and even Rick Riordan … author of a number of series’ for younger readers using existing mythology as a backdrop for his tales Greek, Roman, Egyptian, and now Norse … has gotten into the act with his Magnus Chase series. But it all starts with the myths and Gaiman has updated the myths, brilliantly. Gaiman has a special knack for myth-telling and he re-tells these classic Norse tales in his own unique way, embellishing a little here and there. …Which of course is precisely what the reader is hoping for. My personal favorite embellishment here is Gaiman’s take on the Mead of Poetry. If you search online you can get to know the classic Sturluson story, but Gaiman’s is not only funnier, it actually makes just a little more sense. I read through the Prose Edda about six years back when doing some research for a project. It was fantastic to read the myths and the tales and I wanted to go out and tell everyone I knew to read them. That wasn’t likely to happen, of course, but with Gaiman’s re-telling, many more people will start to know these stories — and that’s a really good thing. These stories will now by accessible and much-read. My only request … please tell more of them. Looking for a good book? Neil Gaiman’s Norse Mythology is the modern myth-master’s re-telling of these Nordic classics. It is delightful and anyone with even the slightest interest in mythology or story-telling, should read this. 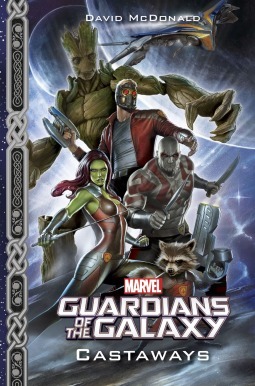 I have enjoyed a lot of novels based on comic book characters – I’ve definitely enjoyed more than I haven’t – and so I look forward to books like this, Marvel’s Guardians of the Galaxy: Castaways, which tie in to comics and movies. Add the fact that it is targeted toward younger readers and I expected a fast-moving adventure. Boy, was I wrong. Just as I was disappointed with the Thor book – same publisher (see that review here) – this book also lacked the verve that made the movie something special. There is a little frustration among the Guardians. Perhaps they are working too closely with one another for too long? So when their ship crashes on a planet with no way to repair the ship and leave, the Guardians go their separate ways to face the unknown on the planet alone. But of course they’ve spent a lot of time working as a team, and they realize that to overcome the obstacles preventing them from leaving, and to help the natives of the planet to see success in growing, they must work together. But first they have to find one another. Mostly with this book I was just bored. It felt a little episodic – as though it were written for a regularly published comic series. This could be developed into page-turning excitement, but simply switches the character focus to move the story forward. I can’t imagine younger readers finding this to be an exciting addition to the Guardians of the Galaxy universe, but I can picture some older fans of the comic (and movie) enjoying some additional time with these reluctant heroes. For me – someone who was not familiar with the characters until the film came out – I don’t know how this book fits in with the universe that’s already been established in the comics and I get the feeling that this book doesn’t really help me get to know who these characters are. The whole concept just really feels messy and lost. Looking for a good book? Marvel’s Guardians of the Galaxy: Castaways by David McDonald tries to build on the energy and excitement of the Marvel movie but fails to capture the energy and excitement that made the film fun. I discovered a new term (to me) for a more specific genre than simply “fantasy” which describes this book. This is a ‘portal fantasy’ – one in which someone from today goes through a portal into another dimension or another world (either accidentally or knowingly). I don’t have any pre-conceptions over whether portal fantasies are typically good or an over-used plot device. It’s simply a means to establish a character as a stranger in a strange land as far as I’m concerned. The portal device is used here as teen Saffron Coulter falls through such a portal to enter a different realm known as Kena. There, she adopts quickly to living the native life and getting involved in social and political issues. Saffron meets Gwen, who was also born on Earth and is now known as a Worldwalker because of her ability to travel between multiple worlds … except other than coming to Kena, we aren’t aware of any other world-walking. Saffron also becomes a Worldwalker and is granted a little bit of awe and respect for it. Not quite sure why or why the residents of Kena would just accept that someone can walk between worlds/realities. There is some political strife going on and Saffron gets drawn in to the conflict, which has Saffron and friends on the run. But even the threat of capture or death isn’t nearly as concerning to Saffron as what people on Earth might think of her having disappeared without a trace. And Saffron is just beginning to discover her sexuality and develops a lesbian sexual relationship. Author Foz Meadows is certainly ambitious with her desire to take on LGBT issues and race issues in a social sci-fi adventure. I applaud the effort but wish that there had been a stronger story and better character building so that the issues might stand out a little better. The biggest problem is that the characters are just boring. It appears as though there is a lot going on, but the journey is rather dull and it’s really hard to get behind or care about these people. Saffron didn’t do anything to make me dislike her, but she also never rose up to ‘become somebody’ worth following. Early on we had a couple of chapters that were nothing more than massive info dumps. Having Saffron go through a portal and run in to some people from Kena led to those people (Zech) simply telling Saffron all about the place and what to expect. I don’t make notes in my books too often, but I couldn’t help notating the massive info dump because it really got the story off to a horribly slow start. Meadows also relies on dumb luck a little too much. One of the biggest cases was when Saffron’s blood was a the only one that matched for a transfusion. Yes…Saffron from another world/realm/reality was the only one who had the same blood. Whew! Wasn’t that lucky?! And then came on of the biggest shocks for me… Just a little over 2/3 of the way through the book Saffron comes face to face with a dragon. A DRAGON! Okay…cool. It’s a fantasy. Except that nowhere in the previous 340+ pages is it even mentioned that Kena is a place that has dragons. (You know it’s easy to search for words and terms on Kindles!) There are some on banners and flags earlier, but even in that massive info dump early on no one says to beware the dragons. It’s as though we took a massive left turn on our journey and forgot to tell everyone that we turned. Penance. Magic. Battle. Blood. These four words become a mantra at one point and I feel as though Meadows was trying to use these four words as the basis for the story. It would have been great if she had, but sadly these four things get lost in a morass of trying to do too much. Books with a social relevance, particularly those of LGBT and race issues, can be really fantastic. These are issues that we are taking a hard look at in our own world. But you still need a solid story and characters with depth to hold a reader’s interest. Looking for a good book? 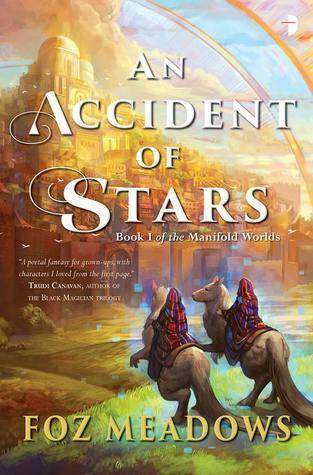 An Accident of Stars is a portal fantasy by Foz Meadows that takes on some tough social issues but delivers it in a sloppy, dull tale. I feel as though I’m generally pretty proficient when it comes to technology and social media, and after a few books promising ‘help’ to writers that I’ve found to be less than actually helpful, I was just a tad hesitant to go into this book (even though I had requested it). But I’m glad I read this, and found Barb Drozdowich’s Blogging for Authors to be one of the most useful books I have read in a very long time. One of the things I really like about reading on a Kindle is how easy it is to highlight something, and I use the feature a lot to make note of special passages that I might want to use in a review. I started highlighting passages in this book very early on … not so much to quote from, but for things I felt were important, as a writer/blogger, to follow up on at a later time. And as I read, I highlighted more and more until I realized that essentially, this entire book is well-written and packed full of useful advice, even to someone such as I who thought he had a pretty good handle on this already. The book is written to speak to the most basic and simplest of needs – to the wanna-be-blogger who doesn’t know where to start. But the basics are a good thing to be reminded of for those of us who think we’re beyond this. There were so many little tid-bits of information that I know, or should know, that I’ve simply over-looked or never gotten around to fixing. Drozdowich reminds me that all these little aspects are important to anyone wishing to take blogging up a level. It should be noted that Drozdowich definitely leans in favor for one particular blogging platform (though she does touch on some of the others) and if you are not a fan of WordPress for some reason, you might not like that she spends so much time here. I have blogs on WordPress, Blogger, and Weebly and I can understand why she focuses on WordPress. This was a VERY handy book. I am delighted that I got the chance to read it for review. Now I will re-read it for myself, and then I will look for some of the other books that Barb Drozdowich has put together. Looking for a good book? 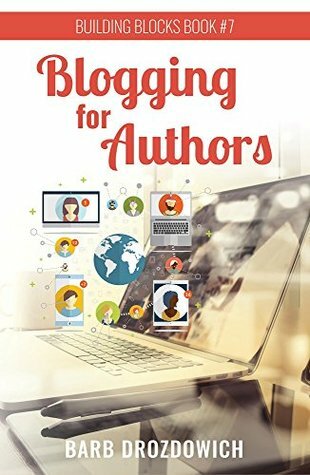 Blogging for Authors is a helpful book by Barb Drozdowich that any aspiring (or even seasoned) writer/blogger will find useful. Only MAD® Magazine can parody a classic and get away with it. Here MAD® takes on the children’s book classic, Goodnight Moon and mashes it up with Batman. It’s a short book (about 30 pages), just as the original Goodnight Moon is short. The art is quite typical of what you would see in one of the MAD Magazines – it has its own unique style, and that is a style that anyone familiar with MAD Magazine would immediately recognize. The story is … well … stupid. Just as you would expect. A tired Batman wants to go to sleep but must first punch the lights out of all his enemies. Then he can go to bed. The rhyme scheme is not nearly as good as that in the original, Goodnight Moon. I tried reading it out loud with the same inflection and I just couldn’t do it. It’s not quite there. This is a fun little book in just the way you would expect a MAD parody to be a fun little book. It won’t have a lasting impression, but might be the perfect gift for that geek you know but never know what to give him for a gift because he buys everything he wants on is own. Looking for a good book? 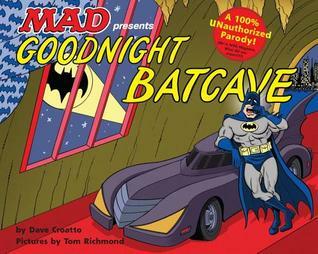 Goodnight Batcave is a Goodnight Moon parody from the makers of MAD Magazine. It’s fun for a quick read but not necessarily something you would want to read over and over again. So many people seem to be falling in love with this book, but I can’t help but wonder if it is due in part to a great publicity campaign, of if I’m just really missing out on something. I was not enthralled with this book. The biggest problem that I have with this book is that it lacks a true focus. Titled, Magruder’s Curiosity Cabinet, it is not unreasonable to expect that author H.P. Wood is writing about a ‘thing’ – a cabinet – or at least that it would play a major part in the book. But the book is about a plague that hit Coney Island around the turn of the 20th century (an imaginary plague … no such plague struck that era). Or is it about the plague? Maybe it’s really about ‘The Unusuals’ – a group of misfit people living on Coney Island and looking after one another. Or maybe it’s about Kitty Hayward and her mother (and dead brother) who arrive on a ship from Africa to have to find their way in the strange new world? It could be about all of these things (and it is), but suddenly we have a story that is trying to tell too many stories, with too many characters. I liked the The Unusuals. I don’t mind admitting that this is what I was expecting … a story about a group of circus oddities. Look at the title. Look at the cover art. I know … don’t judge a book by its cover. But we are drawn to books for a variety of reasons. Titles and covers are a part of that, especially when an author is new to the potential reader. So…while I recognize that a lot of my problem with this book is with my expectations (and that the book was not ‘about’ what I was expecting it to be about), that is over-come-able. A strong character or story-line can still draw me into a story. That didn’t happen here. Because of the plethora of characters, no one stood out as the central character and I was never really behind anyone. I started out eager to follow Kitty, but she never became a central figure that I cared about. I just can’t recommend this book. Looking for a good book? 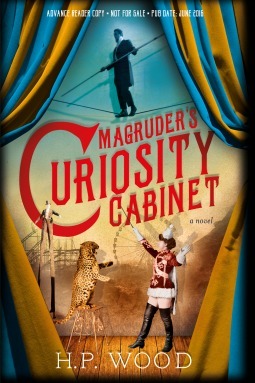 Magruder’s Curiosity Cabinet, by H. P. Wood, captured my curiosity but never satisfied it.